I am really looking forward to the MY RUN Premier. March 31st will be here before you know it and the theaters will be filled with runners - will you be one of them? 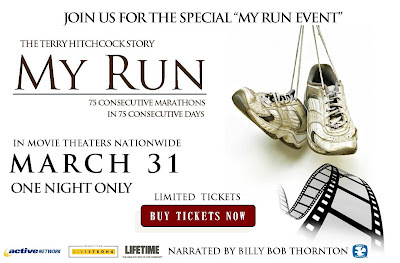 Thanks to the producers of the MY RUN Movie, I am giving away another pair of tickets for one lucky winner. It is going to be really easy to enter, and you don't have to live near me, you can live anywhere there is a theater playing the MY RUN Movie. To find if it is playing near you, go search here. If you are planning on going as a running group you will not want to miss out on the deal to get FREE Tickets that I mentioned in my last post about the movie. That is a short trailer to give you just an idea, for more you may want to watch the extended trailer. Let me start by saying, don't wait to see if you win before you purchase your tickets. There are limited tickets and if you wait you may not get into the theater of your choice, if at all. I suggest you go purchase your tickets, and then if you win you can invite some of your running friends. This is going to be really simple..... Giveaway ends March 16th. Leave a comment, any comment will do..... but if you would like to leave a comment about the struggles of being a single parent, how many consecutive marathons you have run, or anything else about running that would be great! I will give extra entries if your share this giveaway anywhere, anyhow. Just leave an extra comment for each way you shared it and you will get those extra chances. For more information about the movie visit their Website or Fanpage. this is a really inspiring story-I look forward to seeing it! I would love to win tickets! We are thinking of going as a group! i plan to run my first marathon on oct 16th/2011...and because of this- i am beginning to live and breathe running. and what an amazing feeling! i would LOVE to win these tickets! I think it'd be a great, inspiring story! If i don't win... i'm goin' anyway. My first marathon is in June and i NEED the ispiration. I'd love to win the tickets! I've never run consecutive marathons (five weeks apart is the closest), but I appreciate the suffering of others! I also shared the contest on Facebook. A friend just reminded me that just two years ago I was in awe at him running 10 laps....And now here I am running marathons! My how life can change so quickly in just a blink of an eye. And I wouldn't have it any other way! Looking forward to seeing the movie!